Scoil Mhuire Caisleán Nua had an enrolment is 119 pupils of mixed gender. The teaching staff is comprised of 4 class Teachers including a teaching Principal, 1 Resource teacher, 1 shared Learning Support Teacher and 1 Special Needs Assistant. Scoil Mhuire has the welfare of the students in all matters, as its primary objective. The aim of our school is to provide a safe, structured and stimulating educational environment for each student. Thus the responsibility of the school is to help each student reach his/ her fullest potential. This means fostering the spiritual, moral, intellectual, social and cultural development of each student. It depends intrinsically on the interest and positive support of Board of Management members, staff, parents and students. The school depends on the grants and teacher resources provided by the Department of Education and Skills. Create a caring environment, which encourages respect, trust, consideration and support for others. Foster in each individual a strong sense of self-esteem and self-worth while appreciating the value of others. Provide adequate facilities and a relevant curriculum, which will cater for the full and harmonious development of each child – a curriculum that is flexible enough to cater for the uniqueness of each child, so that all children will achieve their full potential. Promote an inclusive ethos in all areas of school life. Scoil Mhuire Caisleán Nua project aims to create a recreational space from a wet heavy clay unusable area of ground within the school grounds. This area is approximately 44 meters long and at points 26 meters wide, it has a fall of approximately 1 meter running SE to SW and SE to NE. As our school has no recreational space/assembly hall to facilitate the children nor has it outdoor seating, we hope to develop an open class room/theatre space which will be incorporated into the garden which will be sensory in nature and have available seating. The theme within the school garden will serve as both therapeutic and educational, as well as evoking the sensory perception range from sight and hearing, smell and touch, and taste. We aim to incorporate a garden of nutrition, art, music, physical education, curriculum and therapy. The benefits of a school garden programme which are many will evolve and become more apparent as the garden programme is implemented. Use the garden as a way to release stress, frustration, anger and hyper-activity. Gardening, similar to music and art, offers a way to release emotions without a conscious therapeutic agenda. Teach reciprocity by sharing with students the reciprocal relationships of plants and people. Explain how just as plants need water, food, light and constant attention to be healthy, so do people. Experience the importance of reciprocal relationships by witnessing the effects that a positive relationship can have on a garden. Use the garden as a place to make mistakes without judgement. Record your trials and errors as lesson for future school gardeners. A green thumb club can be integrated into the school programme through providing in-class or after-school enrichment. Students may be appointed by a school teacher to join a garden or green thumb club. Students who may not excel in sports or academics could be perfect candidates for garden leaders. Build self-empowerment by giving youth a chance to see what hard work and dedication can produce. This sense of accomplishment builds self-esteem and self-respect. Science: Gardens can address physical and life science related to plant biology, life cycles, weather, ecosystems, water, decomposition, and the interrelationships between plants and humans. Math: Gardens provide an excellent place for observation, data collection and experimentation. Math skills are obtained as we measure the growth of plants, trees, and plan for the dimensions of the garden. Comparing and contrasting the success of different plants and different conditions combine both science and math concepts. English: Reading and writing activities abound in a garden as they provide an often quiet, serene location for creativity and observation and a fresh subject matter for study. Gardens provide inspiration for poetry and storytelling. Language is incorporated with the study of plant names and their Latin roots. Local history: We endeavour to use local materials where possible. Pupils will become familiar and appreciate local history. Shares changing story about farming and gardening practices in different time periods. Geography: Pupils will become familiar with local natural resources such as local stone- limestone. Drama/ Performance: Pupils will use the open-air Pergola as a theatre to perform. S.P.H.E: Relating to Others: Pupils will work cooperatively together. Horticulture: Developing Junior Master Gardeners may not be your school’s ultimate goal, a garden can teach the difference between conventional versus alternative gardening methods, plus local food issues, nutrition, optimal and challenging growing conditions, pest management, harvest practices and other related topics that illuminate elements of botany, science, environment and sociology. · Utilise Space. There is no recreational space/assembly hall to facilitate the children in Scoil Mhuire Caisleán Nua. · We want to create an open-air theatre via a Pergola for celebratory days such performances and celebrations. · Turn an unusable area of ground into an educational, sensory, play area. This area of ground is unusable due to the heavy clay base soil and poor drainage. It is not utilised in any way but to grow grass which needs to be mowed and cared for. · The children cannot use the area as it turns to mud quickly and destroys their uniforms. Transforming this area will give the children more room to play and will be used as an open class room and education tool. Install Water System (Rain harvesting already taking place, continue with this worthwhile activity, maybe use solar panels to add to the effective use). 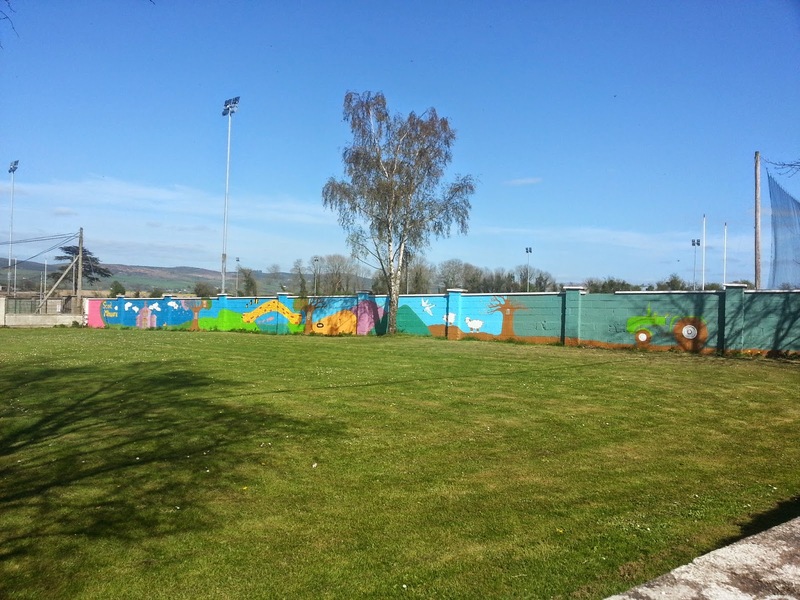 A mural design was created by the children and our local artist Kiara Heffernan and depicts the activities that take place in our local community and encapsulates the natural beauty of the area. Our sensory garden project seeks to compliment the mural by following where possible the movement of the seasons with vegetation, colour and structure, with an aim to enliven the sensory nerves through specific and careful arrangement of various garden elements. We set up a team to work at deciphering the best use from the site to utilise the senses journey within the garden, plus creating an open class room for the children to use for class and play. Selection of shapes in grass will emerge throughout the garden walk. Circular raised beds will break up and divide the areas into different sensory experiences. Seating areas around the existing trees, in the wildlife area and as part of the sensory circles are additional areas of retreat for reflection. Where possible we will use local stone and other natural materials. The site is owned by the school and is part of the school grounds. Scoil Mhuire, Newcastle was awarded tidiest school in South Tipperary. This is due to the efforts of the children, school staff and Michael Bray. Scoil Mhuire, Newcastle was awarded its first Green Flag from An Taisce this year for recycling. We ran a project where we created a vegetable garden from recycled materials. Thanks must be given to the Garden club who worked hard on this project, their parents who helped build the garden and the school staff who were happy to get digging and planting with the children. The school garden project to date has cultivated interrelationships between different class and age groups. Group decisions making, team work and learning to actively listen to others has benefited the whole school. The school garden club have a proven track record of taking care of a vegetable garden and have shown great commitment and enthusiasm for gardening. Watering of the plants as they establish will need to be monitored by the School Garden Club. Once established the shrubs are of a hardy nature and will require very little water maintenance, relying on the rain. Structurally, the Sensory Garden should not need much maintenance at all, as most of the materials are native to Ireland and of a hardy nature. Local stone will be donated for the building of seats and raised beds. The use of ground breaking machinery, JCB, fuel, plus man hours is being donated. In Kind labour is anticipated to be orchestrated by our local volunteers and we hope the school children and their families will get involved. Currently onboard we have a number local with expertise in building, landscaping and drainage who are enthusiastic about the project. We also have our own local artists, a horticulturist, the school committee, two experienced and qualified stone masons, electrician, plumber and some excellent helpful local people who are currently helping us get this project off the paper into an active project. We have secured one year maintenance contract for the garden from South Tipperary Development Company, TUS and the support of labours for the building of the beds and pathways. While the benefits of this project far out way the negative aspects of the project, consideration must be taken into account for sustainability and continual maintenance. While maintenance will be the primary role of the School Garden Club, community assistance has been sought for the general care of plants, pruning, pest and disease management etc for the years ahead. We have received funding to build this garden but access to other forms of funding and find raising events may take place over the coming years to add to this garden experience. Donations of materials, machinery, time and labour has been agreed but more may be sought when to have this completed on for our Completion date. We have been very fortunate to have people onboard who will manage the main hard landscape structure which we need in place to proceed. There is the possibility that members may fall short of their commitment to uphold the maintenance on the garden due to volunteer overload or commitments to other community projects. To address this, we are creating an implementation committee that will take ownership of tasks and document the process, materials, maintenance requirements etc. Cross training the members will help to deal with any short falls. The projected budget figure is in excess of €40,000 but with the mural paint already donated and the volume of In kind labour, materials donations, a percentage of plant and machinery hire for free, plus the of free expertise of masons, artists and horticulturists along with the school committee and parents, the funding required is for this project is halved. We have sourced lowest local prices available for product but will continue to work on lowering these prices.